A lot of movies ripped of Halloween, but most of them at least had to courtesy to copy and paste different names into the script. Not so with the Canuck-born Mark of Cain, which features a guy named Michael (Robin Ward) who murders a girl before escaping a sanitarium 15 years later. He even has his own doctor (though they at least changed his name to Clifford) who tries to track him down. As you might imagine, that’s pretty much where the similarities end between these two, both in terms of plot and quality, as evidenced by Halloween’s status as a classic and the fact that most of you probably hadn't heard of Mark of Cain until you clicked on this review. Anyway, yes, Michael splashes a girl’s insides and blood all over a picturesque Canadian winter before crucifying her to a tree to open the film. This Michael is actually part of a set of twins, with his brother Shawn being the sane one who doesn’t enjoy re-enacting the crucifixion with innocent girls. Still, he’s a good brother, so he visits his psychotic counterpart over the years, at least until he falls in love with a girl (Wendy Crewson) and marries her. One day, Shawn swings by to inform Michael that he and his new bride are going to sell their childhood home (the same one where all the bloodshed occurred), information that doesn’t sit well with Michael. You might say Mark of Cain is just a John Carpenter (and maybe a Donald Pleasence) away from being pretty great, which is to say that it’s so very far away from even being good. Instead, it’s so terminally predictable that its script might as well be laying in your lap as you watch it; of course one of the brother's left-handedness will come into play, and of course there’s going to be an identity crisis when the two finally meet. Usually, I’d shy away from any sort of mid-movie spoilers, but Mark of Cain is so insultingly brazen about its big “twist” that it doesn’t even matter; when we see both brothers in a dark basement and only one emerges, can we really be surprised if the homicidal one has pulled a switch-a-roo? Of course not--it seemed so obvious as I watched it that I was sure it’d actually buried an actual shocker down in there somewhere. But it doesn’t, and I’ll at least give Mark of Cain credit for not dwelling on the body switch plot point for too long. Even though anyone watching it will pick up on it immediately (unless you’re stoned), the characters don’t quite come around for a few minutes, so the big suspenseful centerpiece here involves Crewson being stalked by Michael (who she thinks is Shawn). The question that arises doesn’t so much center on whether or not Doc Clifford will figure all of this out in time, but rather, on whether or not you’ll really care. 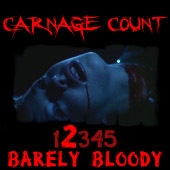 I didn’t; I suppose Crewson and Ward make for an affably bland couple, and psycho-Ward makes for a meek and bland villain who doesn’t even perpetuate that much carnage after the impressive blood-soaked massacre. About the only curveball the movie has to offer is the reason behind Michael’s psychosis--don’t expect any reductive “pure eeeevil” explanation here, as everything gets spelled out during the flick’s mid-movie exposition dump that also accounts for all of the religious paraphernalia adorning the household. 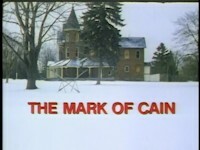 Indeed, Mark of Cain is as bland as the pure driven snow that accompanies the fun opening scene; it looks like a film that likely premiered on the CBC and even seemingly has the commercial break transitions to prove it. This carries a similar look to a lot of Canadian films from the era: hazy, pallid, and altogether dry. At least it sort of works in this instance since the characters are isolated in the frosty, distant Canadian countryside. The director here is Bruce Pittman, who shook off the sleepy doldrums we see here a year later when he delivered the much superior Prom Night II; whereas that film bristles with assured energy and wit, Mark of Cain just lurches on and is somehow unable to find the lean efficiency in a story that only runs about 80 minutes long. I’d ponder if Mark of Cain is Canada’s Halloween, but most would already say that Halloween is just America’s Black Christmas. It can’t even claim to be Canada’s definitive movie about twins since Cronenberg claimed that crown a couple of years later with Dead Ringers. No, just about the only thing Mark of Cain can claim is obscurity, but even that might be more difficult now that Scorpion Releasing has dug it up for their Katarina’s Nightmare theater line, where it’s accompanied by another Canadian film, the techno-slasher Thrillkill. Mark of Cain looks quite washed out and maybe only a step better than it did on its old Vestron VHS release from 25 years ago. There are no special features, aside from the “Nightmare Theater” format that has Katarina pop up and host the flick; she might make it more entertaining, I’m sure, but she has her work cut out for her. Rent it!